What Is A Mallet Finger and How Does It Occur? | Gerald L. Yospur, M.D. What is a mallet finger and how does it occur? You may have heard of mallet finger injuries referred to before as simply a jammed finger. Think of the force of a baseball or basketball hitting the fingertip. This is something that can cause these types of injuries. While this is an injury that is most commonly experienced by athletes, it is an injury that can also happen at home by something as simple as completing household chores and jamming your finger while doing so. This type of injury impacts the tendon that keeps the tip of your finger straight. The tendon is what connects your bone and muscle. 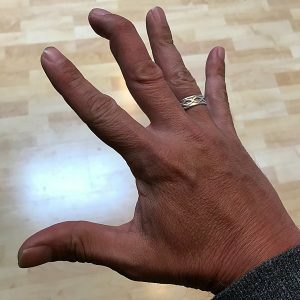 Therefore, if you have experienced this type of injury, or jammed your finger, one of the symptoms you will see is that the tip of your finger will be bent downwards toward the palm of your hand. You may also experience other symptoms such as pain, swelling, and/or bruising. Whether the injury was caused by a forceful blow to the finger by something such as a baseball or basketball or it was caused by something less forceful, a telltale sign of mallet finger is that you will not be able to straighten the finger on your own. This type of hand injury will likely require x-rays to make sure there are no other associated injuries such as a fracture. If a fracture is involved, it will affect the course of treatment. Treatment usually requires immobilization of the finger for at least six to eight weeks. If your injury is accompanied by blood or blood underneath the bed of the nail, it is very important to seek immediate medical attention, as this could be a sign of a more serious injury or one that could lead to complications such as infection. If left untreated, mallet finger could lead to deformity. While most mallet finger injuries can be fixed with splinting, if accompanied by a fracture surgery may be required. Also, if your lifestyle or profession is not conducive to wearing a splint 24/7 during the needed recovery time, surgery may be recommended. Your hand surgeon may also recommend hand therapy to help with the healing process. …you will be glad to know that with proper treatment, you are able to recover from mallet finger injuries and return to normal activities. Dr. Yospur completed a fellowship in surgery of the hand with the Division of Hand Surgery at Maricopa Integrated Health System in Phoenix and is able to help evaluate, diagnose, and treat complications of the hand, including mallet finger. For injuries, same-day appointments may be available. Contact us today.